Self-contemplation is something we don’t like to illuminate. Instead, we choose to relieve our own struggles by talking about others. Through use of nightlights, this work casts light from the moments of personal reflection we experience when laying in our bed at night. Inspired by Film Noir, the graphics express statements that are not always said publicly, but instead stay hidden away in the shadows. The black and white color palette, and yellow glow from the nightlights incorporate a low-key lighting effect, throwing areas of the graphics into shadow and complete darkness. 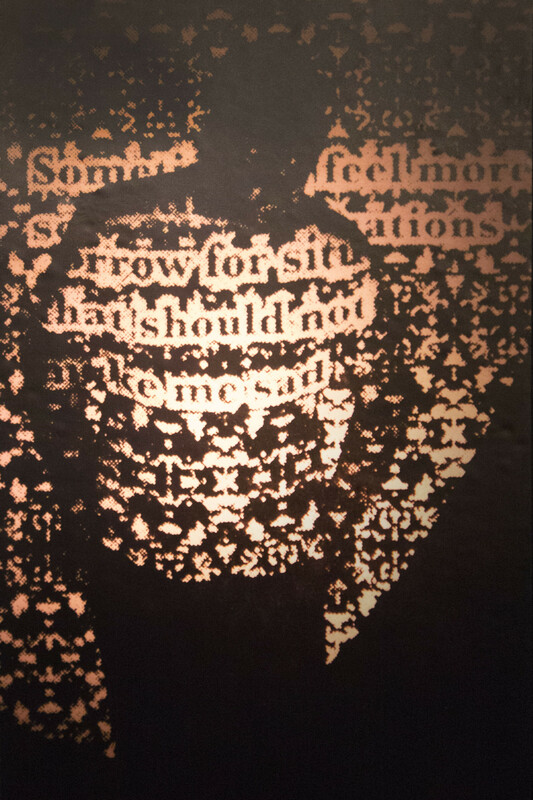 Mysterious and abstract forms are created through projections photographed on the front panels, capturing positive and negative conversational attributes, manipulated by what people say through word of mouth. These confessionals reveal what was once hidden away in a new light. The process behind these photographed images started with self-reflection. Each saying was handwritten and layered over top one another sixteen times. From the layering, shapes were extracted, reflected and combined to get each pattern seen on the photographs. 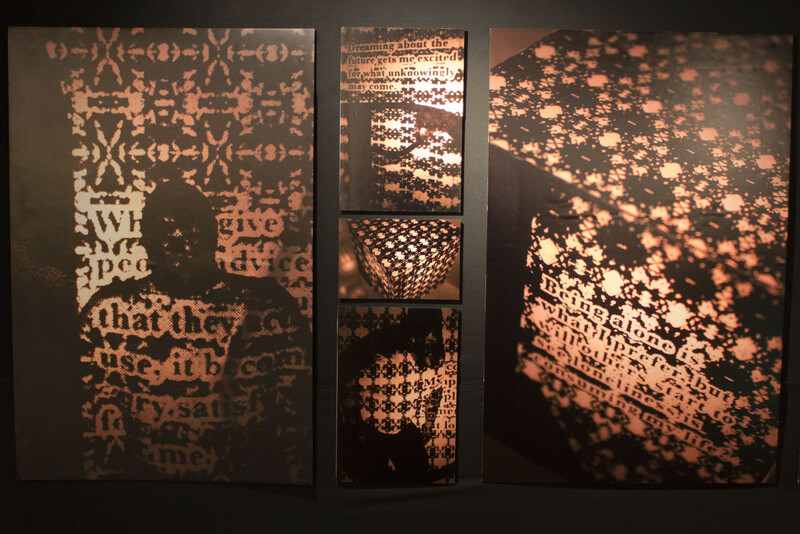 After designing the typed text, patterns, and letterforms in InDesign, the final graphics were projected on to the artist and a photograph was taken to document the manipulation of the text and patterns on the body. When the photographs on the body were complete, the images were brought in to Photoshop and converted to a bitmap in order to get a dot pattern. 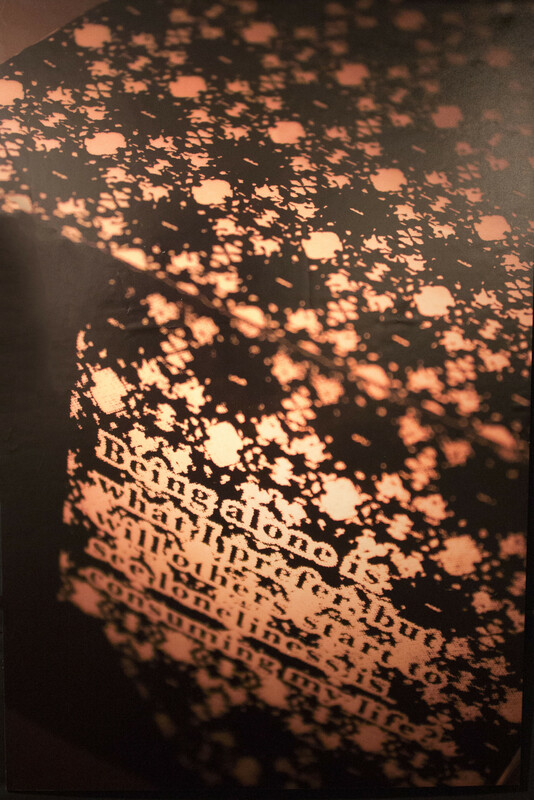 The bitmapped images were then screenprinted onto vellum templates that would form cubes/nightlight covers. After each cube was formed, the nightlights were inserted through the front of a wooden board; so all sixteen lights could be lit at the same time. When all sixteen were turned on at the same time, the nightlight vellum covers were photographed again and the images seen hanging on the gallery wall are the result of this set of photographs.